"This recipe is easy to throw together and goes over great at potlucks. Doubling the recipe makes the perfect amount to fit in my 5-quart slow cooker. Turn up the heat by using hot salsa and jalapenos. Serve with tortilla chips." Heat butter in a skillet over medium heat; cook and stir onion and garlic until tender, 5 to 10 minutes. Transfer onion mixture to a slow cooker. 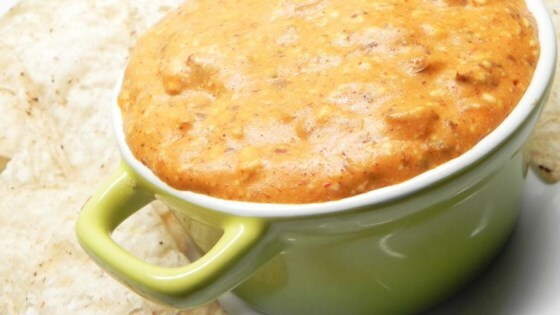 Mix chili, cream cheese, salsa, and jalapeno peppers with onion mixture in the slow cooker. Cook on Low, stirring occasionally, for 4 hours. Super Bowl dip hit. I chose it because the recipe is so simple, and I'm glad I did. Made exactly as written and got runner up in a friendly Mexican appetizer competition! Delicious! I added serrano peppers to add kick - this was definitely a hit!